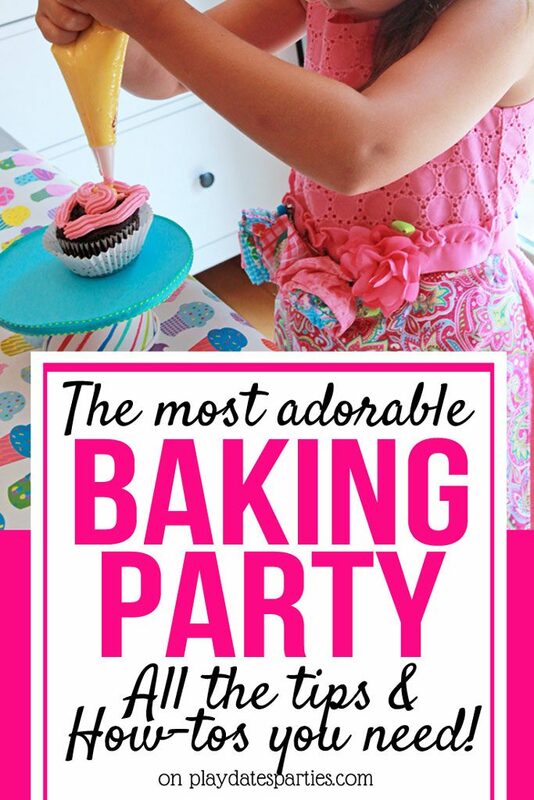 Come in and take a look at the cutest baking birthday party for kids of all ages! It’s filled with ideas that you can recreate, including games and decorations! I’ve taken everything from six weeks to six months to plan a party, but the most labor-intensive party I ever hosted was my oldest’s 7th birthday party. Which I put together in only 10 days. We had the idea sometime in mid-summer to make it a baking birthday party for kids between the ages of 4 and 8. Of course, I loved the idea and totally ran with it. Best of all, since we had (and still have) yards upon yards of extra fabric from past projects, I knew that we could pull the party off without spending too much money. But I had no idea how much time it would actually take to pull together. Of course, it didn’t help that I broke my own rules, and didn’t get started crafting until 10 days before the party. And even after getting a late start…it’s one of my favorite parties ever. It all started by transforming our dining area into a bake shop. The dining room itself was the “back of the bake shop”, where our little pastry chefs would create their masterpieces. The kitchen table was turned into the decorating zone. 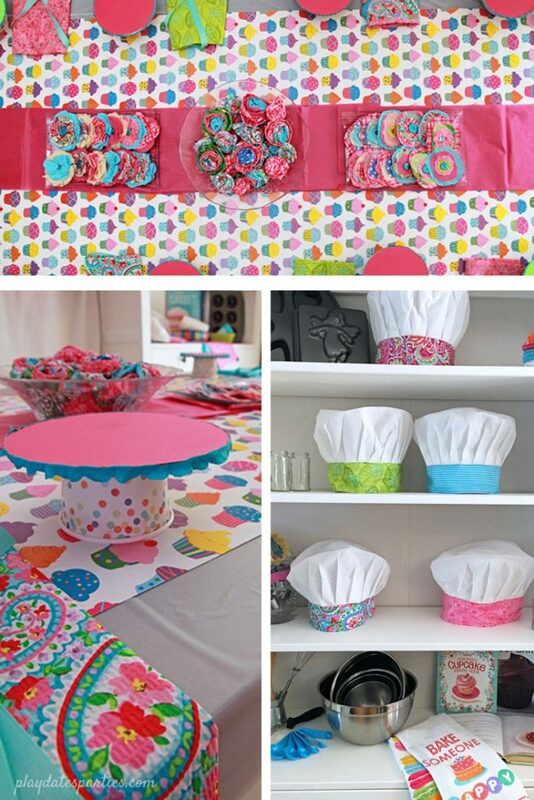 Several baking stations were set up on the table, each with one hand-made apron and a little cupcake stand. 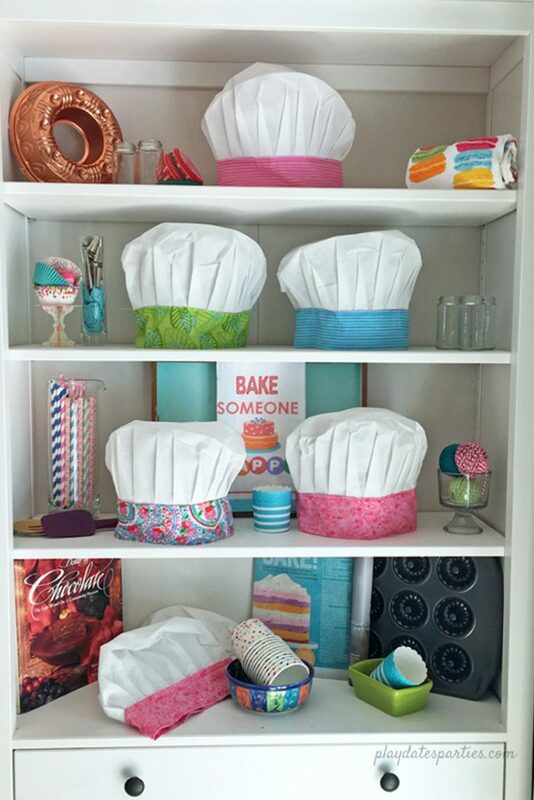 The kitchen island was turned into the “bakeshop window”, where all the undecorated baked good were displayed, as well as a tray full of piping bags filled with frosting, sprinkles, and other decorations. Probably the one thing that the kids ooh-ed and awe-ed over most was the bake shop awning. I took my favorite DIY backdrop frame and adapted it to create an awning that hung over the island. It was just the right touch to give the island that authentic bake-shop feeling. Obviously, this party was before we renovated our kitchen to be worthy of entertaining. As guests entered, they got to take their choice of apron and baking cap. Then, they decorated the hats and aprons with several of the nearly 50 fabric scrap flowers that I made in the days leading up to the party. This gave the kids a fun activity to do as they waited for everyone else to arrive. Once all the kids were there, I let the girls each decorate two cupcakes, and as many cookies as they could manage. They loved the little cupcake stands, and got more creative than I could ever imagine with the decorating. Even though their designs weren’t all masterpieces, the girls had a pretty darn good time making them, and loved sharing their creations with each other. After about an hour, the kids had their fill with decorating their baked goods. 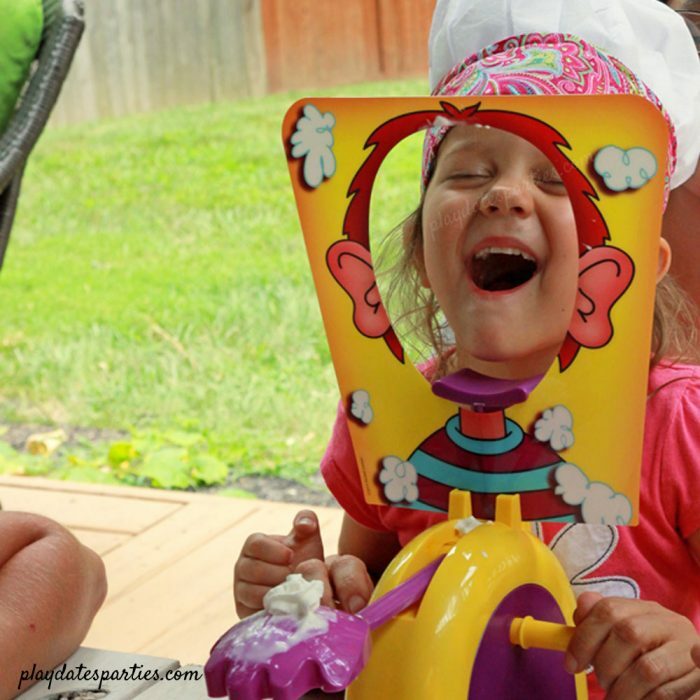 So we headed outside to our freshly renovated deck to play a round of pie face…with whipped cream, of course! Open your mouth as wide as you can right in front of the window. Then, whenever the hand goes up, the whipped cream goes right in your mouth! And if you miss, just lick it up as much as possible. Then, as if they hadn’t had enough sugar, we let them decorate one more cake. As the official birthday cake for the party, a little rice cereal bundt cake was a fun way to get the girls working together instead of individually. It was a bit like chaos seeing them squeeze as much frosting as possible onto that little cake, but it was still a fun time. How Long did it take to Prepare for the Baking Party? I won’t lie, putting together the baking birthday party wore me out. I didn’t start sewing until 10 days before the party, and was only getting about 4 hours of sleep each night to get everything made. Let’s be clear: I don’t recommend waiting this long to start preparing for a party. If I’d followed my own advice, starting the projects about 6 weeks in advance and finishing with 10 days to spare, then I wouldn’t have been nearly as exhausted when the party was over. But, I would definitely say it was worth the effort. How much did the Baking Birthday Party it cost? Luckily, we already had the fabric on hand, and since I borrowed my mother-in-law’s sewing machine, those costs were minimal. I wish I had kept track of the individual expenses, but I believe that the non-food items (cupcake liners, disposable decorations, chefs hats, party printables, etc.) cost about $150. We did end up spending quite a bit by purchasing cookies, cupcakes, frosting and sprinkles from a bakery. However, that was due to other circumstances and were for allergy reasons. 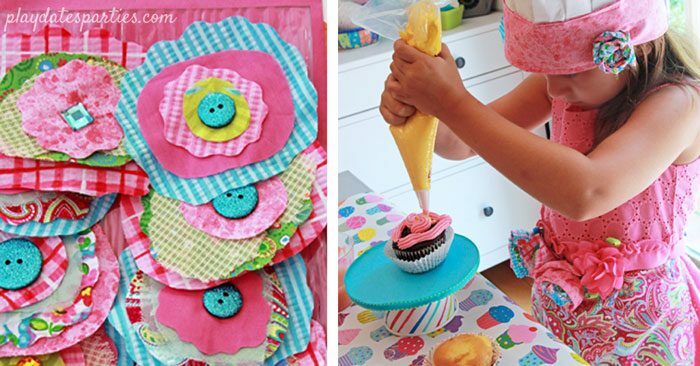 You could easily spend far less making the cupcakes and cookies on your own. Total spent for food: $200. Make easy fabric scrap aprons. Raid your own kitchen first for decorations such as pie pans, mixing bowls, mixing spoons, and other items you probably already have. 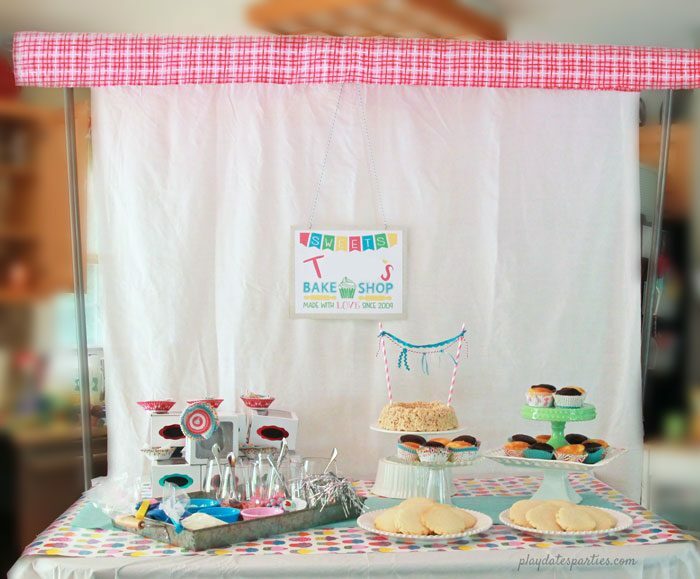 If you haven’t already, make a reusable backdrop frame, and modify it for the party. Find glass spice jars with metal tops to hold sprinkles. These look prettier than your regular sprinkle jars, and can be used by the kids while they decorate. Find an activity to bring them outside. After they all finished playing Pie Face and decorating the little cake, they enjoyed playing around in the backyard for a while to burn off some energy. Time-saving tip: outsource baking your cookies and cupcakes. We ended up doing this due to an allergy of one of our guests, but it ended up being a huge sanity saver. oh my goodness what a fabulous idea. my littel girl would love something like this for her birthday party next year! I’m so happy I found your blog! This is the cutest themed party and I hope I can pull it off as awesome as you have. I know my daughter will love it! 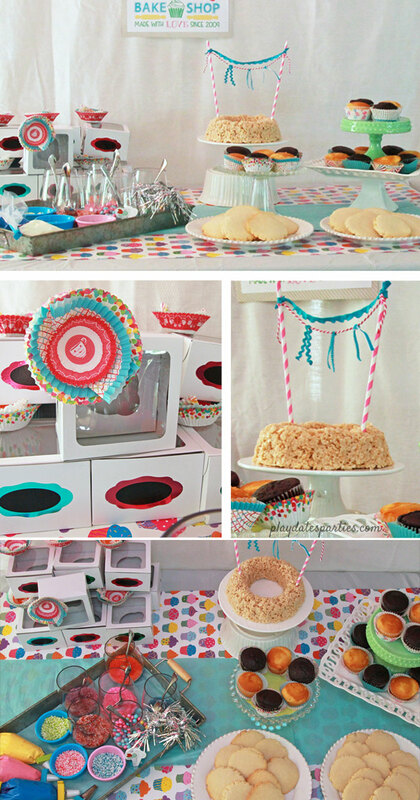 This is such a great theme for a birthday party! You did such an awesome job! 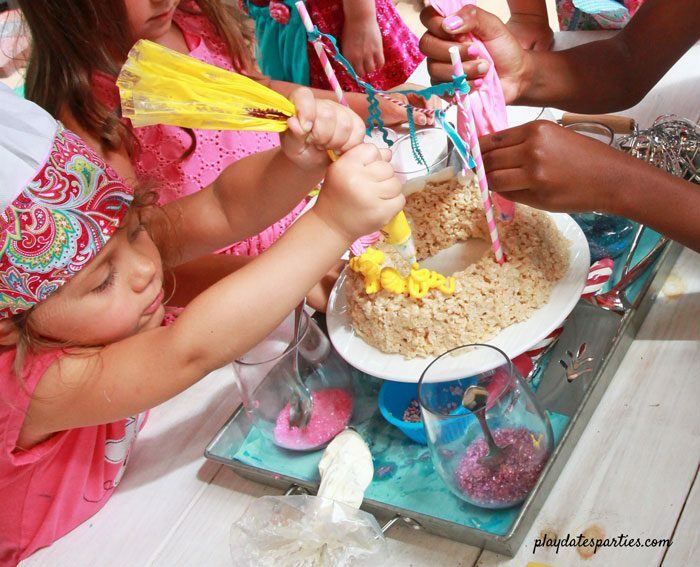 I can’t wait for my daughter to be a little older, I’m going to have fun putting together her birthday parties! So stinkin’ cute! I love to throw over the top parties for my kids too. And since I do it all, I’m always pooped and it takes me a good week to recover! But well worth it, especially since the window on such things is too short. This looks like a spactacular party, all your time and effort in the preparation is evident! I am amazed that you made all those gorgeous hats, I know my girls would love this too. 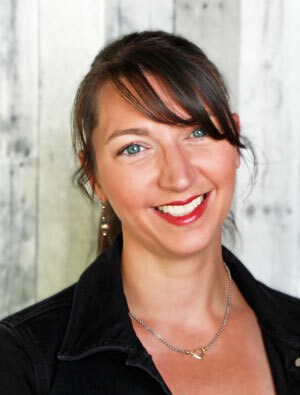 Your lovely post was chosen by another blogger and shared with us on the #blogcrush blog hop this week, congrats! Feel free to pop on over and collect your ‘I’ve been featured’ badge. Wish my granddaughter was older this party is adorable. Found you on Bloggers Pit Stop. What a darling idea! What kid doesn’t love to bake? Thanks for sharing with SYC. Love the chef hats. the kids will have a great time. great idea! What a great party idea! I’m totally going to pin this for my soon to be 4 year old who loves to help cook. How adorable! My daughter would have loved this when she was little! Thanks for sharing at the Summer Time Fun Link Party! 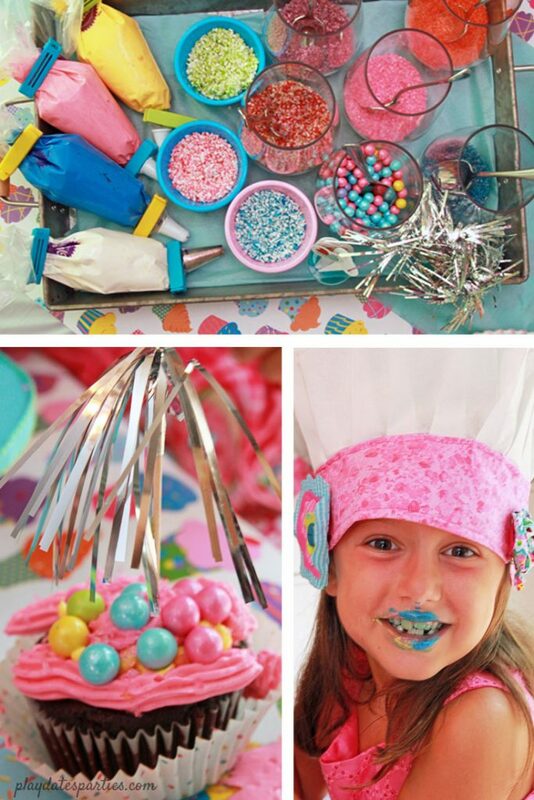 What a cute and fun idea for a kid’s party! I love all these ideas and that photo of the frosting lips is just priceless. Thanks so much for sharing with us at the Summer Time Fun linky. Pinned. 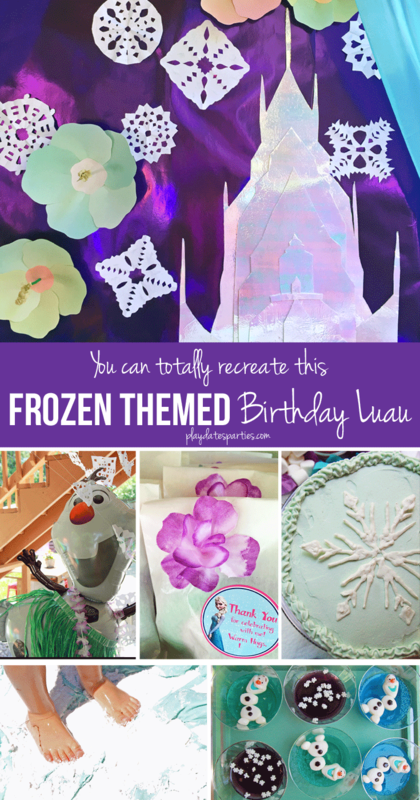 This is the most creative birthday party I have seen lately! Love it and am featuring it tomorrow morning in a blog post for the Summer Time Fun Link Party Features. Thank you for joining in the fun of the link party! Absolutely adorable. To bad I have a teen son.